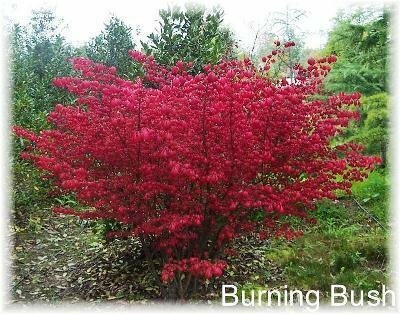 Don't Get Burned by "Burning Bush"
Euonymus alatus is used frequently by landscapers and homeowners in areas with cold or cool winters for its attractive fiery red fall color. However, here are six reasons you should reconsider before purchasing or planting this invasive plant. Burning bush, presumably named after the burning bush which appeared to Moses, has such bright red fall foliage that it could appear to be on fire. Euonymous alatus is a beautiful addition to the New England fall landscape. Wildlife nest and shelter in its branches and birds and small mammals snack on its bright red berries. WHAT'S THE REAL STORY, FOLKS? 1. E. alatus is only attractive once a year. 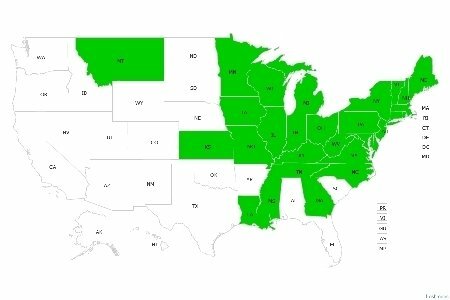 The rest of the year it is plain, boring green. True, it can be stunning in the fall. The leaves on mine seem to blow off with the first nasty gust of autumn wind. Other people in New England report having had theirs actually last for one or two weeks. 2. It rapidly outgrows its alotted space. Mine was planted in the 1950s way too close to the foundation and nearly took over the house. Attempts to develop smaller cultivars have had minimal success. Even Euonymus 'Compacta' grows to be 6 to 8 feet tall and 'Little Moses,' a whopping 8 to 10 feet! Not very "little." 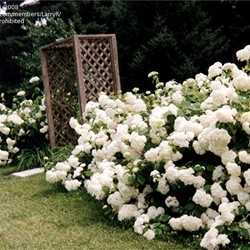 One worried gardener, KariGrows from Wisconsin, said in PlantFiles, "I just purchased one of these to plant this fall and am disappointed to see your website state it should reach 6-8 feet in height, as the tag said 2-3 feet tall and wide. Also it is supposed to be cold hardy to zone 4 not 6 as you state. So now I am concerned over the success I will have adding this to my zone 4 garden. Does anyone have experience with this particular burning bush, Little Moses?" 3. E. alatus has no known competitors in North America, since it originated in Northeast Asia. It was first imported to New England in the 1860s as an ornamental shrub, and now is ubiquitous, in my area at least. Burning bush is sometimes nibbled on by moose or rabbits, according to PlantFiles reports, but it recovers promptly. Its vendors boast that E. alatus will thrive in any soil except in boggy, moist areas and under any conditions except for deep shade. In fact, however, burning bush has been found to take over from natives even in deep shade as an understory plant, as the picture bottom left illustrates. 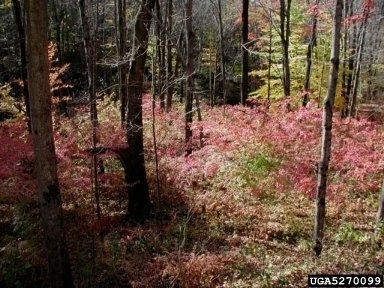 One study in Maine (a state which has yet to outlaw burning bush) examined invasive, non-native species as they took over "a tract of land managed as as natural area:" Oriental bittersweet (Celastrus orbiculatus), Norway maple (Acer platanoides), and burning bush. My money would have been on the Norway maple, which is a terrible weed here in the suburbs and cities (where it was planted by city planners). But no, burning bush steadily, over a 50 year period, beat out the other two non-natives. The native plants, which had been there for eons, never even had a chance. 4. It has an excellent dispersal system: roots and berries, birds and mammals, humans and nurseries. People who say "there are none others on my property besides the one I planted, so mine is not spreading," are forgetting that the reason birds are so important in biodiversity is that they fly. 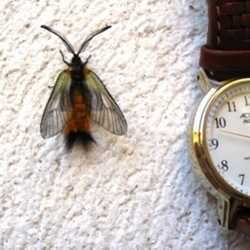 Surely it is possible, at least, that one bush's berries are being eaten and deposited in a whole different area! Irresponsible nurseries continue to sell and promote E. ala tus. "Burning Bush is so adaptable to a variety of soil conditions (ranging from fertile to sterile, organic to clay, acidic to alkaline, rocky to sandy) that it is overused in urban landscapes," warns the Ohio Department of Natural Resources. 5. Banned in Boston, and in fact all of Massachusetts, Connecticut and New Hampshire, E. alatus is illegal to sell, propagate or transport in much of New England already. Although it is common knowledge (or should be) that burning bush is a thug in the Northeast, what the public may not be aware of is that E. alatus has escaped cultivation and is considered invasive in the Midwest and the South as well. The map on the lower right shows states in green where burning bush is naturalized in the wild. (What it doesn't show is that Ontario, Canada, too, is infested.) 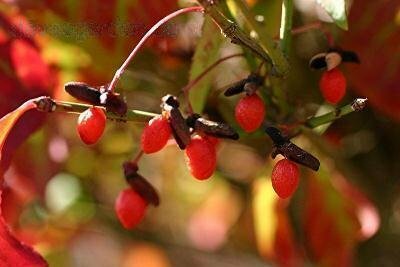 However, the laws haven't stopped nurseries from selling Euonymus alatus nor people from buying and planting it. 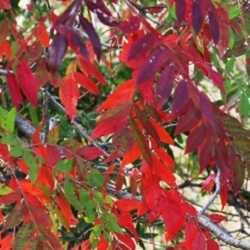 Of GardenWatchdog vendors selling burning bush, only one notes that they cannot ship to Connecticut. highbush blueberry (Vaccinium corymbosum) offers pretty flowers, yummy berries and fall foliage, with many cultivars available. redvein enkianthus, Enkianthus campanulatus seems to be a well-behaved visiting plant. the New York Times recommends Virginia sweetspire, Itea virginica, in the northern edge of its range, noting that "sweetspire can be invasive in the south." In New Hampshire they are so adamant about controlling the Euonymus alatus invasion that concerned citizens are actively digging them up. Please don't plant this ill-mannered guest, ask nurseries you deal with to stop selling it, and if you own a burning bush already (and aren't willling to dig it up), try to get the berries off before the birds do. Even cutting it back drastically, as I did with mine, means fewer berries to spread. And check out some of these fascinating links! Photos courtesy of designart, Melody, and Lynn Hutchinski. Map used wiith permission of the EDDsMapS, Early Detection & Distribution Mapping System. The University of Georgia. The photo of understory burning bush infestation is copyright Leslie J. Mehrhoff, PhD, University of Connecticut, Bugwood.org. My list of alternative plants is culled from many different sources, but if you see a familiar suggestion it might have been yours... or not.